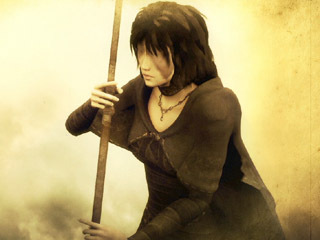 The Maiden in Black is a NPC in Demon's Souls. The Maiden in Black is said to have once been one of the most powerful Demons in existence. Her ability to harness and manipulate the souls of the player-character certainly seems interesting. She maintains a direct communion with the Old One, and is even able to lull it back to sleep should the character accept her offer, making her considerably more powerful than it. Don't worry about accidentally attacking the Maiden - she'll never become hostile, and, after a short delay, comes back to life when killed. Standing in the center of the stairs leading down to the area with dozens of messages. If you choose the good game ending, you get the Maiden in Black's Demon's Soul (can be used to purchase the spell Soulsucker from Yuria, the Witch during NG+). Let strength be granted so the world might be mended. Thou can'st not exit the Nexus, but each of the five Archstones will connect thee to another node. The Monumental awaits thee, above. The Monumental will explain the Nexus to thee. Brave soul, who fears not death. Prithee, lull the Old One back to its ancient slumber. What is it? Dost thou seek soul power? I understand. Pray forgive me. Perhaps my opinion of you was wrong, I am sorry. I have always been here in this Nexus. I was here when the Old One awakened, and I will be here when It rests once again. After all thou requireth strength. Go forth; touch the Demon inside me. Let these ownerless souls become thine own. Art thou done? May thine strength help the world be mended. Then touch the Demon inside me. As for me? I am only here to tend to the flames. I keep the candles lit and serve the brave Demon slayers who are trapped here. I shall await thine return, slayer of Demons. I am here for thee and thee only. Hark, I hear a voice of yore. The Old One is calling for thee. Let us proceed below to its lair. Old one, I have brought thee what thou wisheth. Thine new Demon. Come, now, be good. Let us proceed below to its lair. Slayer of Demons, go back above. The Nexus shall imprison thee no longer. I shall lull the Old One back to slumber. The Old One and I shall slumber interminably. That is the way it must be. Thou may'st go. Be gone to thine world. She does not become hostile when attacked and, while in the Nexus, resurrects shortly after being killed. Killing her does not grant souls, though the Needle of Eternal Agony's attack still earns souls when used on her.